Thirteen years ago, professional surfer Taj Burrow hosted his first ever signature junior surfing event, the Small Fries at his home beach of Yallingup in Western Australia. In January 2019, the event will return for the 14th consecutive year in what has fast become one of the most anticipated junior surfing competitions in the country. 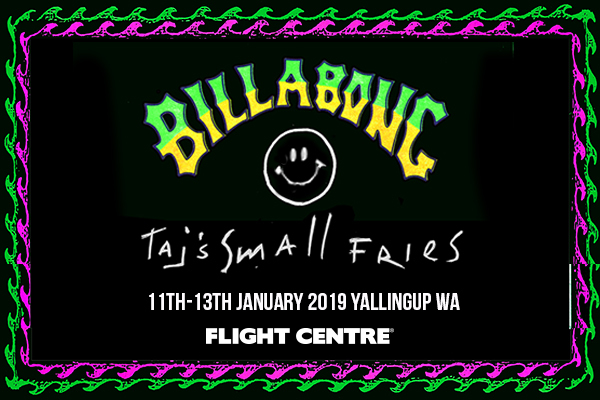 Surfing WA with principal event partners, Billabong and The City of Busselton are proud to bring the 14th instalment of the Taj's Small Fries Yallingup, on the 11th, 12th & 13th January 2018. Junior surfers can line up in the 16 & Under, 14 & Under, 12 & Under, as well as 10 & Under divisions in the wave rich Yallingup region of South-West WA. No doubt the 2019 event will be one of biggest and best yet so get in quick to avoid missing out. To be eligible to enter Taj's Small Fries you must be the specified age or under as of the 31st December 2019. - 16 & under surfers cannot turn 17 on or before the 31st December 2019. - 14 and under surfers cannot turn 15 on or before the 31st December 2019. - 12 and under surfers cannot turn 13 on or before the 31st December 2019. - 10 and under surfers cannot turn 11 on or before the 31st December 2019. All divisions are limited, with entry allocated on a first in first served basis. If you enter the wrong division - you are not guranteed a spot in your correct division. A refund is only available if advised that a competitor cannot attend the respective event 7 days prior and a valid doctor’s certificate is provided. Please ensure you read & understand age eligibilties to prevent disapointment.